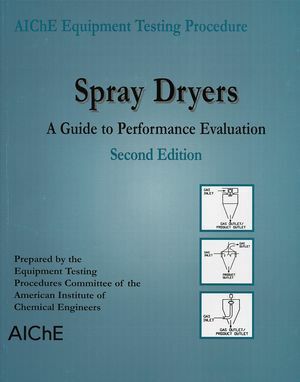 Spray Dryers: A Guide to Performance Evaluation, Second Edition discusses the reasons for spray drying. These reasons are usually to produce a product with certain desired properties or with better efficiency than other methods. The book discusses how to plan in light of these objectives and gives guidance on the variables affecting product properties and dryer performance, to decide which variables to evaluate. Technical spray dryer installations are briefly described. Checklists are given to aid in planning measurements and listing steps needed for a test. The AMERICAN INSTITUTE OF CHEMICAL ENGINEERS (AIChE) is a distinguished professional association that strives to provide leadership in the advancing chemical engineering profession. The Equipment Testing Procedures Committee is composed of engineers with substantial experience in the design and operation of process plants, as well as in solving problems that can arise with the equipment used in these plants. Reasons for Testing Spray Dryers. Definitions and Descriptions of Terms. Prediction of Capacity and Rate Effects. Data Requirements - Product Properties. Methods of Measurement and Sampling. Duct Temperature and Velocity Profiles. Accuracy of Dry Bulb Temperatures. Accuracy of Gas Wet Bulb Temperature. Material Temperature and Moisture Content. Radiation and Convection Heat Losses. Running a Definitive Test in a Plant-Scale Dryer. Enthalpy or Heat Balances on the Dryer. Material, Moisture, and Energy Balances. Dryer Heat Losses and Thermal Efficiency. Example: Evaluating Drying Capacity of Air Stream. Example: Dryer Test With Psychrometric Chart Heat Balance. Evaluate Product and Evaporation Rate. Ambient Air Humidity, Enthalpy, and Humid Volume. Check Driving Force for Evaporation. Moisture Balance - Evaporation Rates. Heat Balances: Heat Duty and Fuel Consumption.